MIRAMICHI, N.B. - The Conservative government won't budge on rules that Canada's biggest telecoms say will give foreign wireless firms an unfair advantage, Prime Minister Stephen Harper said Friday. Harper said he understands companies like BCE Inc. (TSX:BCE) have to stand up for their shareholders and employees against allowing giant foreign firms like Verizon Communications Inc. to move into the Canadian market. But he said Canadians want to see more competition in the industry and lower cellphone rates. 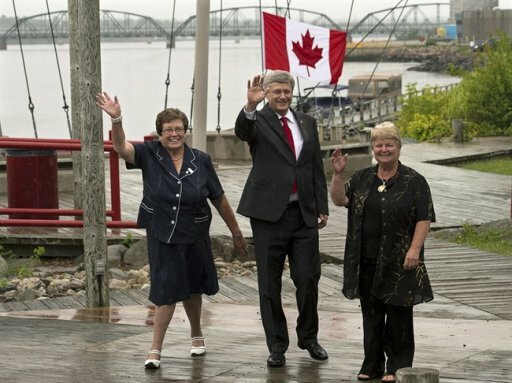 "Our government has pursued this very consistently ... a policy of fostering greater competition in this industry for the benefit of Canadian consumers over the past few years," said Harper following a funding announcement in Miramichi, N.B., for harbours. "While I appreciate some companies have interests that are very important, our government's first priority is the wider Canadian public and Canadian consumers and we are convinced this is where they want to see us go." There have been reports that U.S.-based Verizon Communications is exploring a move into the Canadian market by purchasing Mobilicity or Wind Mobile, two of the new wireless carriers that launched their services a few years ago. The Canadian carriers are disputing rules that would allow Verizon to use their wireless networks and bid on more wireless spectrum than the incumbent carriers at an auction planned for January. Spectrum refers to the radio waves used by mobile communications devices. Harper said the federal government will proceed with the auction as planned. "We have seen some results from that policy. We have every intention of continuing that policy in the interest of Canadian consumers and the broad Canadian public, including proceeding with the auction as we have laid out for some time." Bernard Lord, the president of the Canadian Wireless Telecommunications Association, said in a phone interview there is still time for Harper to change course on the policy. Lord, a former Tory premier of New Brunswick, said the government must rethink the rules because they were created to allow new entrants into the industry, not to permit foreign giants to come into Canada and scoop up a key part of the business. "If the government wants to open the borders, they must close the loopholes first," he said. "It's simply unfair to let a large American company come in and be able to bid on two of the four spectrum blocks when some of the Canadian companies can only bid on one." Telus Corp. (TSX:T) said any changes to the rules would need to be made by Sept. 17, which is the last day to file a deposit to participate in the spectrum auction. Josh Blair, chief corporate officer of Telus, said in an interview that his firm welcomes increased competition but it's unfair that a foreign company would have greater access to bid on wireless spectrum. "Given we've invested $100 billion in Canada since 2000, we've earned the equal right to bid on spectrum against a company with the deep pockets of Verizon," he said. He also said if a major foreign competitor comes into Canada, it should also be obliged to build a pan-Canadian network like the large Canadian firms have done.